In a press release, dated Oct 29, 1957, Premier J.R. Smallwood estimated that as many as 200 settlements in Newfoundland “with no great future” and involving as many as 50,000 people could be resettled (Stacey Collection, CNS). The images displayed on this site are all associated with the various government-sponsored resettlement programmes implemented in Newfoundland and Labrador between 1954 and 1975. While there was a definite trend towards urbanization before 1954, the direct intervention of the government in the process was a new and controversial development. The Smallwood government had two main aims. First, it wanted to ensure that all residents of the province had access to a reasonable level of government services, as well as to telephones and electricity. The provision of health care facilities, schools, roads, post offices and other services could be achieved more cheaply and efficiently if people moved from small, isolated settlements to larger centres. Second, the government was determined to modernize the fishery by encouraging modern technology in catching and processing - which meant trawlers, fish plants and expensive new harbour facilities. In addition, the government wanted to attract new industries to the province, and had ambitious plans for a diversified economy. Industrialization would be concentrated in larger centres, where there had to be a pools of labour available. In 1954, the provincial government, through the Department of Welfare, began to provide financial assistance to families prepared to resettle. Initially, the government covered the actual expense of moving. This was later replaced by a payment to each family, starting at a maximum of $150 and eventually increasing to $600. Every household in a community had to agree to relocate before the money was paid. Between 1954 and 1965 110 communities were abandoned, with a population of about 7,500. A new federal-provincial resettlement programme was introduced in 1965, administered by the Department of Fisheries. So long as 90 percent (later 80 percent) of a community's households agreed to move to a designated growth centre, each household was eligible for a grant of $1,000 plus $200 for each dependent. In addition, the programme paid moving costs, and up to $3,000 for a serviced building lot. There was a second federal-provincial agreement in 1970, with responsibility being shared by the federal Department of Regional Economic Expansion (DREE) and the provincial Department of Community and Social Development. Between 1965 and 1975 some 148 communities were abandoned, involving the relocation of an additional 20,000 people. 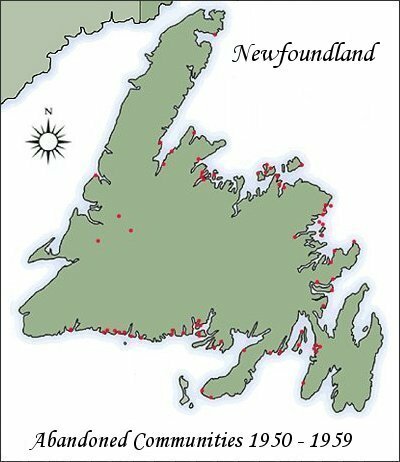 The main areas affected were the islands of Placentia Bay, Bonavista Bay and Notre Dame Bay, as well as communities on the southwest coast. Receiving areas included Burgeo, Harbour Breton, the base of the Burin Peninsula and the Placentia area. 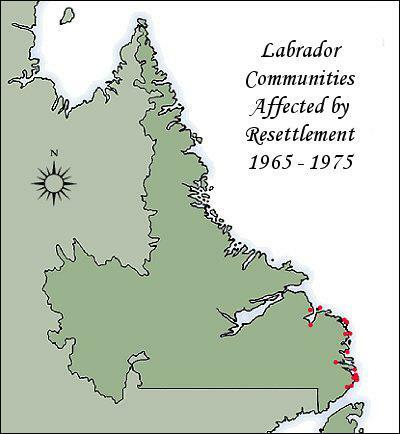 In Labrador, resettlement was less concentrated, most of the movement occurring in communities on the southeast coast, under an amendment to the programme which allowed individual households to resettle provided certain conditions were met. Most who resettled within the region moved to Mary's Harbour and Cartwright. Active government involvement ended in the 1970s as the programme became increasingly unpopular. There was a lack of jobs in the receiving areas, promised industrial developments did not occur, and many of those who moved felt that they had been forced to leave their homes - if not by direct government pressure, then by that of others in the community. Moreover, the government had let it be known that services would be discontinued if the population of a community dropped below a certain level. Nevertheless, studies have shown that most - but by no means all - resettled families were satisfied with the move, citing such factors as better educational opportunities. Overall, some 307 communities were abandoned between 1946 and 1975, and over 28,000 people relocated. Captured in film, poetry, visual art and music, the response to resettlement was an important political thread in the province's cultural renaissance in the 1970s. The programme had a profound impact on the lives of those affected, and continues to resonate in the culture and collective psyche of the province today. The images provide a fascinating reflection of resettlement more than three decades later. This virtual exhibit contains photographs collected primarily from people who moved under the program, allowing us to see resettlement through their eyes. Since it would have been an overwhelming task to collect and present images for all communities abandoned during resettlement, we have selected twelve - Battle Harbour, British Harbour, Colinet Island, Deer Harbour, Exploits, Fair Islands, Hooping Harbour, Ireland's Eye, Merasheen, Point Rosie and Sop's Island - to provide what we hope is a representative sample. We have also provided images of two communities that received new residents under resettlement, Arnold's Cove and Salvage. We gratefully acknowledge the financial support of the Department of Canadian Heritage through the Canadian Culture Online Program, Library and Archives Canada, and the Canadian Council of Archives. Nous remercions le minist�re du Patrimoine canadien pour le soutien financier qu'il nous a accord� par l'interm�diare du programme Culture canadienne en ligne, des Archives nationales du Canada et du Conseil canadien des archives.